This foolproof but impressive dish is based on a recipe that appeared in the Oregonian a few years ago. A friend who lives in Portland sent it to me, and we both use it as a summer party trick. For filling variations, see the Notes below. Transfer the dough to a clean work surface, and with the palm of your hand smear the dough 2 or 3 times across the work surface until it is smooth and the flour and butter are well blended. Do not overwork it or it will become tough. Cut the dough in half or in thirds, and form into round disks. Cover with plastic wrap and refrigerate at least 1 hour and up to 24 hours before rolling out. (If chilled overnight, let dough sit at room temperature 30 minutes before rolling out.) Disks will keep refrigerated for at least 3 days or frozen for about 3 months. To make the galettes: Position a rack in the lower third of the oven and preheat the oven to 400 degrees. Line a baking sheet with parchment paper or buttered foil. On a lightly floured surface, use a floured rolling pin to roll out dough into a circle about ⅛-inch thick. For a 10-inch galette, roll dough into a 12-inch round; for a 7-inch galette, roll dough into a 9-inch round. Transfer rounds onto parchment paper or foil. Spread the filling over the rounds, leaving a 2- to 3-inch border. Fold the border of dough up over the filling, allowing the dough to pleat as you lift it up and work around the galette. It will pleat naturally, so just allow it to do so. Leave the center of the galette exposed. Dip a pastry brush into water, milk, or the egg wash, and give the edges of the crust a light coating. Sprinkle the edges with the 1 teaspoon sugar. Bake for 35 to 45 minutes; check after 30 minutes and turn the oven down to 375 degrees if the crust is browning too quickly. Serve warm or at room temperature. Culinate editor's note: You can skip the pastry wash and the sugar coating steps; these simply give the crust a nice brown sheen. Variations Ricotta and zucchini galette: Mix 1/2 to 1/3 cup ricotta cheese with 1 beaten egg. Spread the ricotta-egg mixture over the galette dough, then spread 2 to 3 cups total of sautéed sliced zucchini and oven-roasted tomatoes on top. Squash and leek galette: Layer the galette dough with 3 cups diced butternut squash (peeled and oven-roasted), 2 chopped and sautéed leeks, 1/2 cup shredded Gruyère cheese, and 1 tablespoon each fresh sage and thyme. 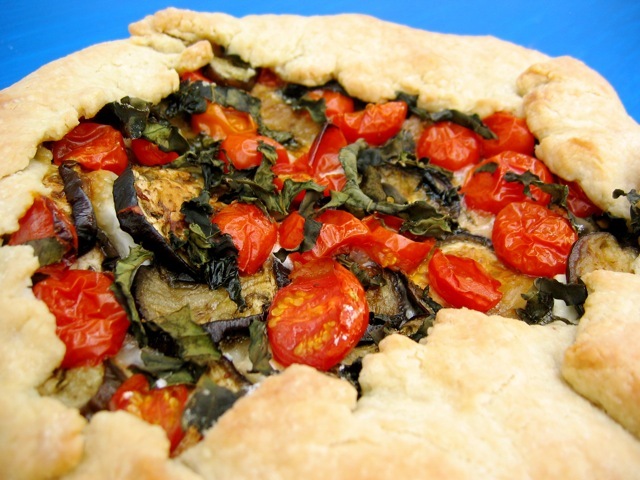 Eggplant and tomato galette: Layer the dough with 2 cups diced eggplant, 2 cups diced oven-roasted tomatoes, 3 ounces crumbled goat cheese, and 8 to 10 fresh basil leaves cut into strips. Mushroom, chard, and onion galette: Layer the dough with 1/3 cup shredded Gruyère cheese and top with 2 to 3 cups total of sautéed mushrooms, diced fresh chard, and sweet onion strips. Quince and cheese galette: Mix a drop or two of water into 4 to 5 tablespoons quince paste and soften the mixture in the microwave for 10 seconds; smear the paste over the dough with the back of a spoon. Top with 5 to 6 ounces thinly sliced Cowgirl Creamery Red Hawk cheese or other triple-cream cow’s-milk cheese. Fig, honey, and cheese galette: Layer soft goat cheese, sliced fresh figs, and honey over the dough. Read more in Jamie Passaro's essay about learning to cook as an adult.